Action: The left lady is a Chinese, dressed in tunic and skirt or trousers (unclear), the right one a Manchu wearing a dress and jacket. Both hairdos are typical; their particular shapes come from the frames which are covered by hair. 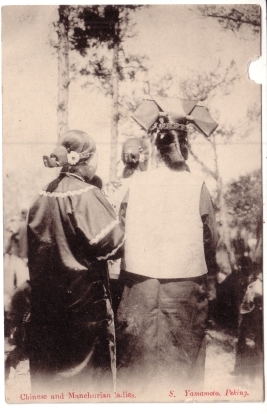 Regarding hair ornaments, the Chinese fashion puts them mostly behind, the Manchu has them in the front.